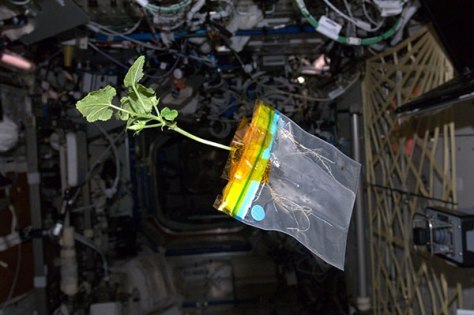 A zucchini plant floats aboard the International Space Station. From Don Pettit's blog: "This bag is mostly filled with air and only has a small amount of water neatly tucked in the corners from the action of capillary forces in weightlessness. This is aeroponics, a rather new method for raising plants without soil and without large volumes of water." Image released April 3, 2012.